These rare and beautiful Mercedes sports cars were built between 1964 and 1971. We love them for the way they combined beauty, power and handling; with safety, reliability and comfort. The earlier SLs had beautiful lines, but were lacking elsewhere. 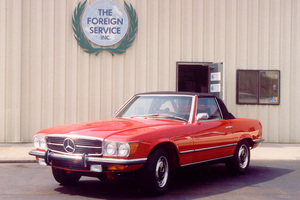 With over 35 years experience in Mercedes repair and service, business owner and Master Mechanic David Pettengill thoroughly knows and understands your classic SL. Together, our Mercedes specialists have close to 100 years of experience. We have kept more than 50 of these special SLs up and running over the years. The Foreign Service combines a great wealth of knowledge and capability with quality service and integrity. Please explore our website for much more about us and our work. 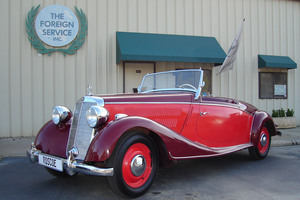 Then feel free to call us regarding your classic Mercedes. "I was hesitant to ship my 250SL all the way from Seattle for a major restoration, but after several conversations and reference checks I decided to go for it. I never regretted it for a moment. In fact, it turned out to be one of the best service experiences I've had with any shop, on any car, anywhere ... bar none." "I finally got a chance to slide underneath and look at your handiwork; the guys at the factory would be jealous!!! It's nice to know there are still people around who take the time, and have the expertise to do the job right!" "I would like to thank you for your wonderful work on my 560SL. I really appreciated your honest opinion of the car. 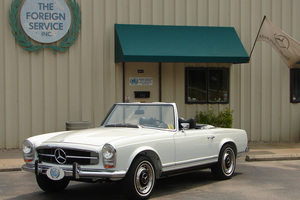 I am so glad I found The Foreign Service and wish I would have done so 11 years ago when I first got the car." "The job you did on my 280SL is incomparable. The car is in better than new condition and I am proud to drive it anywhere. It is really reinforcing in this day of "quick, slick and overcharged" to meet quality people like all of you, who actually do what you say when you say."